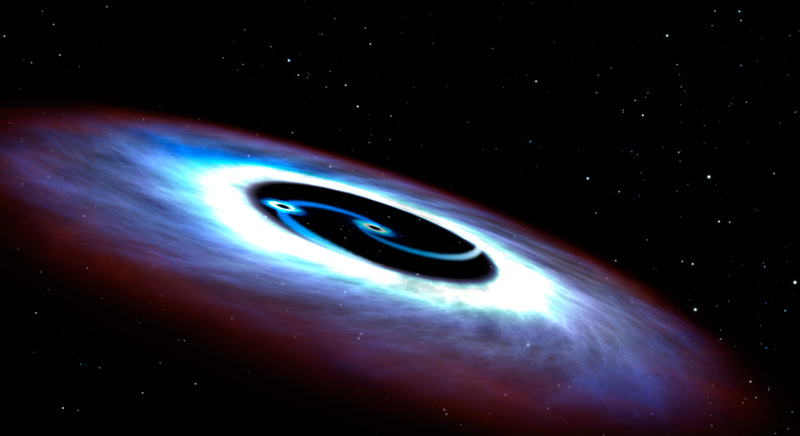 This artistic illustration is of a binary black hole found in the center of the nearest quasar to Earth, Markarian 231. Like a pair of whirling skaters, the black-hole duo generates tremendous amounts of energy that makes the core of the host galaxy outshine the glow of its population of billions of stars. Quasars have the most luminous cores of active galaxies and are often fueled by galaxy collisions. Hubble observations of the ultraviolet light emitted from the nucleus of the galaxy were used to deduce the geometry of the disk, and astronomers were surprised to see light diminishing close to the central black hole. They deduced that a smaller companion black hole has cleared out a donut hole in the accretion disk, and the smaller black hole has its own mini-disk with an ultraviolet glow.